This tableau forms part of the permanent exhibition in the Upper Pump Room. It depicts Mrs Mitchell being winched out of a peat bath, part of her first day's treatment at the Spa. On display there is a large number of artefacts and there are interpretive explanations of daily life at the Spa. Craigvar is in the centre of Strathpeffer, a unique, outstanding conservation village, 20 minutes drive north of Inverness. Its location makes it an exceptionally good touring base from which to explore the Highlands and Islands. We are 45 minutes from Ullapool on the West Coast and an ideal day’s round trip could take in the majestic scenery of Wester Ross, including Skye, Plockton, Eilan Donan Castle, Inverewe Gardens and Gairloch. 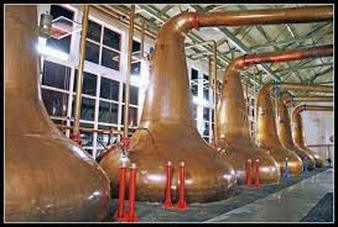 There are also distilleries within easy reach (Glen Ord, Dalmore and Glenmorangie) and a close up view of dolphins can be had at Chanonry Point in Fortrose, depending on tides. We are equally well situated for the nearby East Coast, with easy access to Inverness, Culloden Visitor Centre, Nairn, Cawdor Castle, Fort George and Loch Ness with Jacobite Cruises sailing throughout the year. The Black Isle is a lovely half-day tour, taking in Fortrose, Rosemarkie and Cromarty. We are also less than 3 hours from John o' Groats and the Castle of Mey. Craigvar is perfectly located for hillwalking and Munro climbing. The village offers a number of amenities including bowling, tennis and golf, and five minutes away there is a sports centre and a swimming pool. Dingwall is the home of Ross County FC who are playing in the Championship this season, where they again play their derby rivals, Inverness Caledonian Thistle. The grounds of nearby Castle Leod regularly host cricket and shinty matches. Ross County Cricket Club's first XI play in the Macallan North League and Caberfeidh Shinty Club play in the Marine Harvest Premier League. For walkers and cyclists there is a number of routes, of varying difficulty, in and around the village. The world famous Strathpuffer 24 hour endurance Mountain Biking event next takes place in January 2020. There is regular entertainment locally during the season and, from the 4th June onwards, the Strathpeffer & District Pipe Band plays in the Square every second Tuesday evening at 8:30 p.m., along with Highland Dancers from the Marion Munro School of Dancing. The 2019 Strathpeffer Games are on the 10th of August. The Pavilion is next door and regularly promotes music and theatre events as well as their annual Art Fair in November. Things to do are arranged by distance. The items at the top of the list can be visited on foot and combinations of the others can easily be done in a day by car. Download a selection of driving tours from Craigvar, with times and distances to get there. Open most days from 9.00 – 5.00. Allow one hour on foot for the tour. Castle Leod is widely considered to be the inspiration behind Castle Leoch, the seat and home of the laird of Clan Mackenzie, in Diana Gabaldon's 'Outlander' historical fiction series. ​Allow half a day for exploring by car. Half Day & Full Day Activities. The inspiration for Robert Louis Stevenson's rapturous quotation. "Near here is a valley; birch woods, heather and a stream; I have lain down and died; no country, no place, was ever for a moment so delightful to my soul" . 10 minutes by car on the Garve Road. Climb Ben Wyvis, our local Munro. An ideal way to bag your first Munro. A half day's climb up and down 'The Ben' if you are fit but a little longer if you are an enthusiastic beginner. Military Museum and working fort. Visit Fortrose, Rosemarkie & Cromarty. 45 minutes by car to Cromarty. Visitor and Exhibition Centre on the shores of Loch Ness. Sub-tropical gardens on the West Coast near Poolewe. Featured in the James Bond film 'The world is not enough' and in 'Highlander' with Christopher Lambert. Allow 2 hours by car. Stay here en route or take a drive on one of its most spectacular legs. Visit Applecross, driving over the renowned Bealach na Ba (The Pass of the Cattle), whose summit rises to 2053 feet, and return on the coast road by way of Fearnmore, Shieldaig and Glen Torridon. ​Allow 4 hours driving time for the round trip of 140 miles.